The Sol Blatt Jr. Law Library makes many resources available for bar preparation to recent Charleston School of Law graduates and alums. SONITROL card access to the library, Equitrac account printing, and the circulation of study rooms and bar prep materials are automatically generated for the December 2015 graduate. Other alums, taking the bar at a different time, can also have similar access by contacting me. What resources are available via the library? 1. A Bar Resources Prep guide can be found here. 2. Two iPads with Bar Max can be checked out from the Reference office. 3. South Carolina Advance Sheets are available online here and in print formats in two places: across from the library’s Circulation Desk and in aisle 39A in the library’s stacks. 4. Many bar prep materials can be located in the Reference office. To pull a title list of the library’s materials, check the catalog here, using bar in the keywords field and limiting the search to bar review as a collection type. A list of materials is then found here. 5. Recorded bar prep class sessions are available here. 6. Opinion summaries of decisions from the South Carolina Supreme Court and Court of Appeals are drafted and posted by alum and Evening Reference Librarian, Erica McDaniel, to the library’s blog, the Barrister. 7. A bare bones outline by the National Conference of Bar Examiners on MBE tested subjects is available here. MBE sample questions are available here and more practice questions can be purchased here. 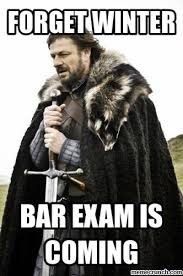 Happy studying and good luck on the bar exam! This entry was posted in Bar Prep and tagged Charleston School of Law, Sol Blatt Jr. Law Library. Bookmark the permalink.